Today, in half of the world, we see rapid progress, modernisation and development. However, there are countries where millions still suffer from the very old problems of hunger, poverty, injustice and conflicts. Indeed, we are reminded in 2014 that a century has passed since the beginning of the First World War, but we still have not learnt all of the lessons that arose from the loss of those millions of lives a hundred years ago. There are still conflicts in which hundreds of thousands of innocent people have lost their lives. Many families have become refugees in Syria, Gaza and Iraq. There are still girls who have no freedom to go to school in the north of Nigeria. In Pakistan and Afghanistan we see innocent people being killed in suicide attacks and bomb blasts. Many children in Africa do not have access to school because of poverty. Many children in India and Pakistan are deprived of their right to education because of social taboos, or they have been forced into child labour and girls into child marriages. One of my very good school friends, the same age as me, had always been a bold and confident girl and dreamed of becoming a doctor. But her dream remained a dream. At age of 12, she was forced to get married and then soon had a son at an age when she herself was a child – only 14. I know that my friend would have been a very good doctor. But she couldn’t … because she was a girl. 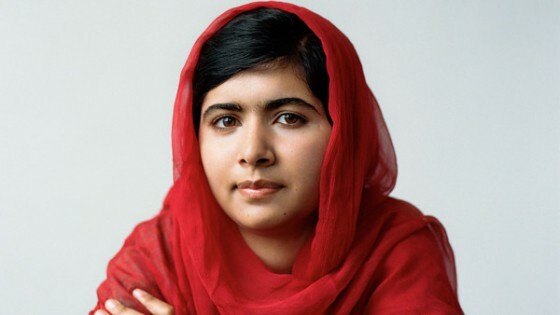 Her story is why I dedicate the Nobel Prize money to the Malala Fund, to help give girls everywhere a quality education and call on leaders to help girls like me, Mezun and Amina. The first place this funding will go is where my heart is, to build schools in Pakistan-especially in my home of Swat and Shangla. In my own village, there is still no secondary school for girls. I want to build one, so my friends can get an education-and the opportunity it brings to fulfil their dreams. That is where I will begin, but it is not where I will stop. I will continue this fight until I see every child in school.